Macushla Robinson is an emerging art theorist and assistant curator of contemporary international art at the Art Gallery of New South Wales. She studied art theory, philosophy and printmaking at the Australian National University and University of Sydney, winning the latter’s University Medal. Macushla has recently been awarded the John Monash scholarship, which will take her to the New School New York to study the complex relationships between activism and contemporary art. In Colombia, tens of thousands of people disappear every year. Colombian artist Doris Salcedo describes her country as ‘full of widows’. She gives an account of one widow who told her “how difficult it was to continue living with objects that are reminders of her husband. 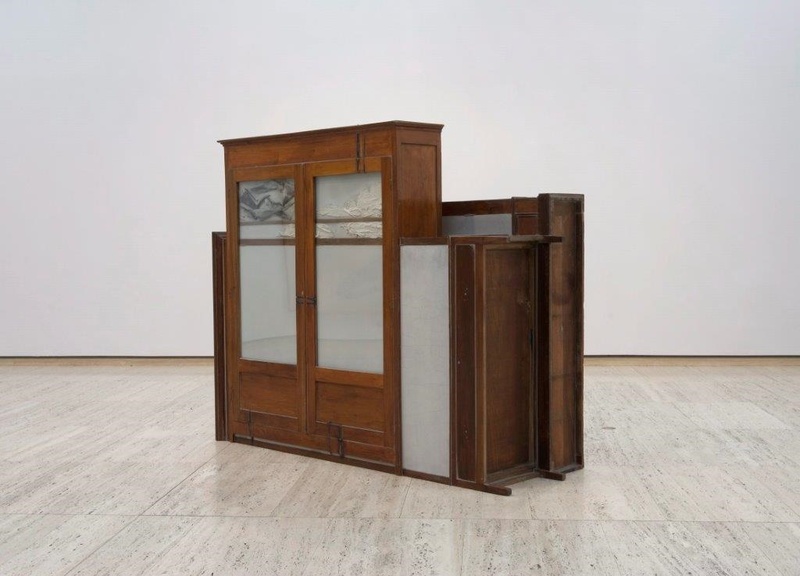 Every morning you open the closet and the clothing is there.” Salcedo’s works often consist of the belongings of those who have disappeared, from shirts starched with plaster and neatly folded, to clothing that has been encased in concrete inside glass-fronted closets. Her use of personal and domestic items, from clothing to household furniture, evokes the impact of Colombia’s ongoing political violence on individual lives. Her landmark work Shibboleth in the Turbine Hall of the Tate Modern in London (2007/08) consisted of an enormous crack in the floor. Not wide enough to fall into, the crack was nevertheless ominous for viewers. And while it was a temporary installation it also never completely disappeared. If you walk through the Turbine Hall today you will be able to find a trace of Shibboleth. It has been filled in with concrete that has a slightly lighter colour, a long line of concrete that reads like a scar in the building itself. Something that has healed but nevertheless remains a visible reminder of the injury once there. In a similar way, her work Atrabiliaros has permanently marked the building in which it was made. 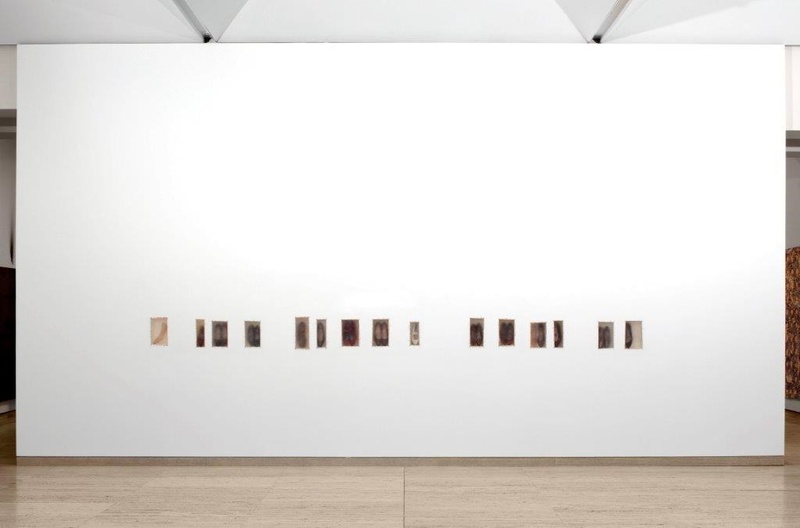 Installed at the Art Gallery of New South Wales in 1997, Atrabiliaros looks like fifteen small rectangles in groups along the wall. 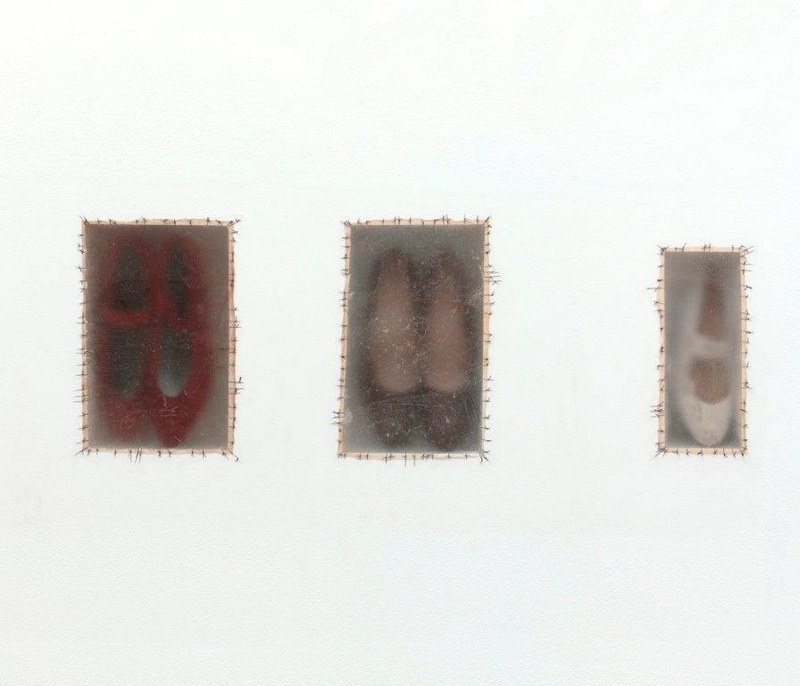 As you get closer, though, you realise that inside each rectangle is either a single shoe or a pair of shoes resting behind a translucent veil that makes them indistinct, but still visible. This veil is made from a cow’s udder that has been stretched and stitched over the surface of each niche with heavy black thread. The combination of animal fibre and stitching recalls surgery. The shoes in this installation are not op-shop finds; they belonged to people who have gone missing. I have been reminded of the power of Salcedo’s work over the past weeks. During this time someone close to me died, and while they took his body from the house, they left all his things behind. His shoes remained scattered around. To help his family, I picked the shoes up and arranged them on the stairs, thinking of how they had absorbed the weight of his body. They were moulded by his gait and way of standing, stretching to accommodate his foot’s particular shape and wearing down in the places where he exerted the most pressure on the ground. Their physicality made his absence sharper and I wondered whether it was better to put them away: whether this was more painful or comforting to those closest to him. Not everyone finds things left behind to be painful reminders: for some they are comforting reliquaries that give weight to a memory. Sometimes we need something physical like this to grab the grief and pull it up from our guts, in a rush that feels like a sponge being wrung out in the chest. But as Salcedo’s Colombian widow reminds us, this can be re-traumatising rather than healing. Salcedo conveys the pain of such constant reminders through her use of materials. In Atrabiliaros each niche is like a wound that has been stitched up but refuses to heal. What would it take for it to heal? Would the wall have to gradually grow over these niches until the shoes themselves disappeared? In a strange way, sometimes the gallery walls do grow over these objects: when Atrabiliaros is not on display it does not go into storage like other works in the gallery’s collection. It is a direct intervention in an immovable wall and cannot be taken down. So we build a wall over it and hang other works on that wall. The niches remain hidden behind that wall until it is time to display them again. It is surely not deliberate, but this aspect of the work operates metaphorically. The disappearance of loved ones in Colombia is not the same as their death: when someone disappears you never stop looking for them, and sometimes they do return again (think of Colombian politician Ingrid Betancourt, who was kidnapped by the Revolutionary Armed Forces of Colombia and rescued 6 ½ years later). For the friends and families of the disappeared the possibility of a concrete conclusion, the discovery of a body or the return of a living person, hangs over them as hope and dread in equal parts. This is an accidental allegory of the simultaneous presence and absence that someone’s disappearance brings about. Thanks to Doris Salcedo and the Art Gallery of New South Wales for granting permission to reproduce these images. © Macushla Robinson and Emotional Objects, 2015. If citing, please kindly refer to the post’s author, title and date, with a link to the original site. Unauthorized duplication of this material without express permission is strictly prohibited.